There are few things I enjoy more than a good 19th-century British novel—the Brontes, Hardy, Collins, Eliot, Gaskell, Austen, and on and on. And so I am always drawn to modern novels written in the style of these great authors. Often, as with The Crimson Petal and the White, these tributes to the great literary past are enjoyable but lack a convincing voice—they’re often too frank, too interested in titillating modern readers to feel like true 19th-century novels. But then, there are novels like Jonathan Strange and Mr. Norrell, one of my favorite books of the last few years—19th-century faery story that feels true to its period. And now we have The Meaning of Night, Michael Cox’s marvelous recreation of the 19th-century Gothic thriller. Until the very moment in which the blow had been struck, I had not known definitively that I was capable of such a terrible act, and it was absolutely necessary to put the matter beyond all doubt. For the despatching of the red-haired man was in the nature of a trial, or experiment, to prove to myself that I could indeed take another human life, and escape the consequences. When I next raised my hand in anger, it must be with the same swift and sure determination; but this time it would be directed, not at a stranger, but at the man I call my enemy. The true author, Michael Cox, manages the difficult trick of giving the writing an authentic-sounding Victorian voice. Even those “shocking” parts referred to in the preface felt true to the period. Glyver mentions his visits to prostitutes and opium dens matter-of-factly as part of his confession. You don’t have to read between the lines, but you also aren’t smacked in the face with the seediness of it all. Really, this is the closest thing I’ve ever read to a 19th-century novel written in the modern day. Highly, highly, highly recommended. Cox’s sequel, The Glass of Time, is being published in the U.S. on October 13. I am all a-twitter with excitement that I snagged an advance copy through Library Thing’s Early Reviewer program. You can be sure I’ll be reading and reviewing it very soon. I’m a devotee of the 19th century novel but hated The Crimson Petal and the White and have been wary of modern attempts ever since. I did buy Jonathan Strange and Mr Norrell, but haven’t read it yet. 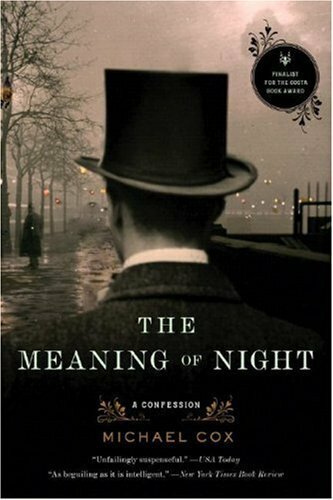 I must read it soon, and also look out for The Meaning of Night. O yay! I found this at a library book sale and picked it up. My husband just read it and wasn’t all that impressed but I LOVE Victorian novels and it sounds like something I’d like. And I forgot I can read it for the R.I.P. Challenge. Yay! This is a truly fantastic book! The sequel, to be published imminently, is also wonderful (takes place about twenty years later). This is one of the best books I’ve read recently as well. It was engaging and convincing for the era. I just found you on the BookBlogs site and I like what you read! Devotedreader: Once I realized that Crimson Petal was a classed-up bodice ripper, I kind of liked it on that level, but it didn’t come close to capturing the voice of the time the way Cox and Clarke do. Amanda: Is your husband into 19th-century Gothic novels? Because if he isn’t, I can totally see why he wouldn’t be into this. If he is, well, I guess that shows how much tastes can vary. I hope you enjoy it, at any rate! Katherine: I’m so glad to hear The Glass of Time is good. I’m only about 30 pages in, and I like it so far. Kristen M.: Thanks for stopping by! I checked out your blog and added it to my reader. We do seem to share some of the same literary tastes! Have you heard of Kept, by D.J. Taylor? It’s in this same style, and while not as good at Jonathan Strange and Mr Norrell I quite enjoyed it, and it’s a good mystery in its own right. I’d definitely recommend it for some moderately light reading if you’re into these faux-Victorian novels. How have I not heard of this? Your description of the modern gothic books is exactly the same way I feel and you’ve got me very, very excited about this one. I may have to make an unscheduled ‘bad boy’ stop by the bookstore tomorrow to see if they have a copy! Nicole: I haven’t heard of Kept. The faux-Victorian stuff is hit or miss with me, but I’ll check my library and see if this one’s likely to be a hit. Carl V.: You know, if you wait just a week or so, you might be able to get the sequel as well. I’m about 1/4 of the way done, and I’m enjoying it just as much.